Gramin Vikas Sansthan has recently issued a notice of Gramin Vikas Sansthan Recruitment for filling up GVS Clerk 1100 Posts. Job hunters who are willing to carve out their career in government sector they may apply by submitting GVS online form with all important details on or before the end date. 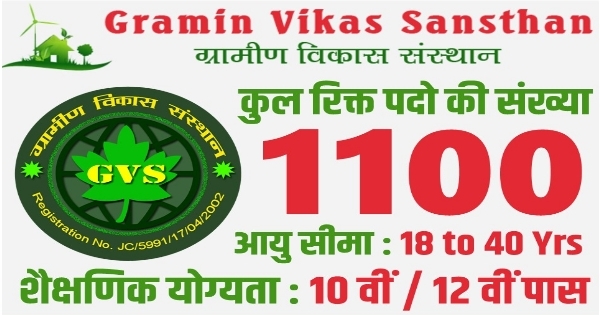 Apply Online, Clutch this chance, Gramin Vikas Sansthan is going to engage talented and eager candidates to fill vacant eleven hundred job openings. Great opportunity for those who are seeking career in the government sector, Closing date to submit an application form is 31st March – 2018. Job location options based upon Overall India. Age relaxation will be as per the organization norms. Job hunters should have passed 8th, 10th, 12th or possess Graduation and Post Graduation Degree from a recognized Board or University as per the rules. Selection process will be based on written test and the Interview.